Top-class lighting is absolutely imperative in healthcare. It can support doctors and therapists during treatments and promote the healing process in patients thanks to an increased sense of well-being. The more systematically good light is used by hospitals, doctors’ offices, retirement homes, nursing facilities and rehabilitation clinics, the greater the impact on the perception of patients. 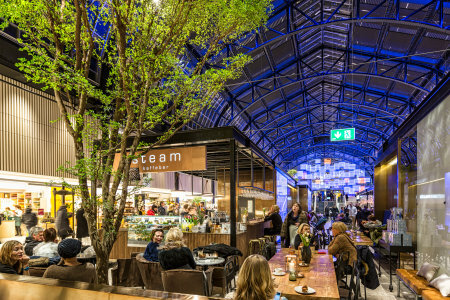 The more natural the effect of artificial light, the greater the sense of well-being among patients, staff and relatives. The right light at the right time in the right place can be a critical competitive edge in a healthcare system characterized by acute cost awareness. Added to this are savings as a result of lower energy costs. "Rising costs, new technologies and treatment methods, patients with increasing demands, an elderly population – doctors' offices and the operators of hospitals and nursing homes must face these challenges. After all, the right light can be a critically important competitive factor!" 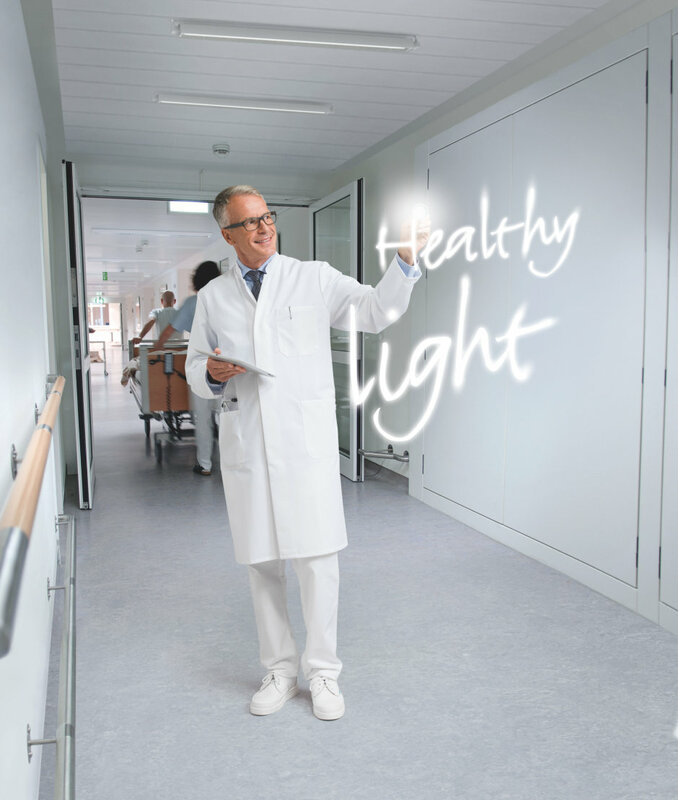 While light primarily ensures clarity in treatment areas and in laboratories, for example, when it comes to patients and staff it should primarily promote a sense of wellbeing. It is also important to strike this balance optimally in doctors’ offices. Together with you, we identify the specific requirements in your situation and thus create ideal working and healing conditions. Visibility and orientation are decisive requirements for light in the area of retirement homes and rehabilitation clinics. At the same time, light should also convey a sense of proximity and security. An apparent contradiction, which we resolve with clear, glare-free light for security and with pleasant bright light with color progressions for a comfortable sense of proximity. Well-chosen lighting solutions create an atmosphere that calms individuals and creates trust. This is the only way that light can have a salubrious effect. Hospitals place high demands on light. The right light must be available in every area of application – delivering the exact quality that is required and serving as a reliable, energy-efficient and low-maintenance solution. The requirements placed on lighting in hospitals are just as broad as these institutions' missions are: The lighting in patients' rooms should have a salubrious effect. The needs of physicians and nursing personnel in operating rooms, treatment areas and laboratories have to be taken into consideration. Attention also has to be given to optimal lighting in waiting rooms, outside areas and administrative offices. The parameters that apply to hospital lighting are always light quality, reliability, efficiency, sustainability and the perfect suitability for the particular lighting job. The highest lighting priorities of retirement homes, nursing facilities and rehabilitation clinics are safety and visibility. The emotional aspect of light is critical as well: Retirement homes are made more homey and comfortable by light. In rehabilitation clinics, the healing process is promoted by it. Clear, glare-free light for safety, indirect lighting for a pleasant setting, and colorful light sequences to create a friendly, comfortable atmosphere. Thanks to light, we can see when it's dark – that's still the main function of artificial light today. But recent studies have shown that natural daylight also controls our inner clock and that light has a significant impact on our feeling of well-being. The state-of-the-art lighting systems of LEDVANCE draw on this effect and can help increase people's concentration, performance and quality of life. Light is much more than just brightness. Particularly in doctors' offices, lighting has a broad range of requirements to meet and jobs to perform. Two lighting aspects must be considered in particular for doctors' offices: Optimal work lighting that assists physicians and office personnel and lighting that has a positive emotional effect on patients' well-being.